Happy Friday! 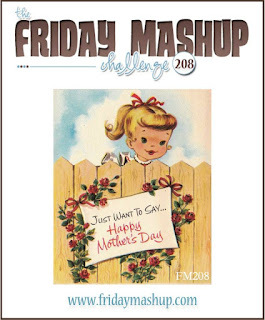 It's time for another Friday Mashup challenge and this week Amy is our hostess. She'd like us to create a Mother's Day project and to use a recycled/upcycled item on it also. I have zero contact with my own mother so my card is being sent to the woman I consider my step mom. I've known her since I was 12 and her and my dad started dating a few years after my parents divorced. They were engaged to be married when my father was diagnosed with cancer and he passed before they could do anything. It will be 5 yrs this October since my dad passed but she still treats me and my family like one of her own and she has been there for me while I struggled with losing my dad. So yep, this card is for her! The sketch is from a recent Freshly Made Sketches challenge, I like they layout. Create a project using a "Recycled or Upcycled Item". Create a project for "Mother's Day". or Mash it Up! and create a project for Mother's Day using a Recycled/Upcycled Item". Its something about the colors of yellow and black together that always make a lovely card. Great team challenge card! Love it! Beautiful mix of patterned papers! Very striking card!